Even if burglars are able to break into your house, find your valuables, and get to them, they still have to get away. Make this as hard as possible. Less than 14% of burglaries are every cleared with an arrest (sources). Security cameras hooked up to a recorder may help improve your odds. After a burglary, you’ll probably call the police and have them file a report, but your case honestly isn’t likely to get much more attention unless it’s part of a string of burglaries. In that case they may catch the guys after they’ve broken into a dozen more houses, but you’re unlikely to ever get your stuff back. Less than 17% of stolen guns are ever recovered. If you have security cameras and can give the police a video of the burglary, this is a huge help. The cops now have a description of the thieves and proof of the crime which will be valuable in prosecuting them. This will probably get more law enforcement attention to your case than the average burglary, and may even make the local news. It may also help in getting your insurance claim handled faster. Another benefit of security cameras is that many now can be viewed over the internet. If you’re away from your house, you can bring up your cameras on your computer or phone at work and make sure everything back home is ok.
Surveillance cameras are getting cheaper and cheaper by the day, and you can get a pretty good setup for much less than a gun safe. For real security cameras to be effective, it’s better if the thieves never see these cameras so that they don’t conceal their identity or avoid walking past the cameras. Put a camera in the room with the gun safe, somewhere it won’t be easily seen. Fake security cameras can add an extra layer of protection and deterrence to your real cameras. Although most home burglaries happen in the day, it’s a good idea to get security cameras that work at night. The burglarized jewelry store mentioned in a previous article had security cameras to record the break in, but they didn’t work in the dark. If your computer is in the same room as your gun safe, you can install a program on your computer that turns your webcam into a surveillance camera. Unfortunately it means that you’ll probably have to leave your computer on all the time. The heavier your gun safe is, the harder it is to take it, rip out the floor bolts, or tip it over. If you reload, put your lead shot in the bottom of your safe to make it harder to steal. Don’t put powder in there though. If you’re building a house, there are a number of ways that you can build a gun safe into your house and get a lot more protection without spending extra money. Floor-mounted safes and gun safes meant to be set into concrete can be poured into a concrete slab. Or you can have your traditional gun safe set into a slab’s concrete, or anchored in a brick wall as it is being laid. You can build the framing around your gun safe so walls have to come down to get it out. When I worked as a plumber, we regularly installed shower/tub stalls that were bigger than framed doorways (before the drywall went in). Take a Sawzall and cut out the nails on the bottom of a stud by running the blade along the sole plate under the end of the stud. Then, pull the stud down off of the top nails and move the gun safe in. When you’re done, line up the top nails to their holes on the top of the stud and they’ll slide back in. Finally toe-nail the bottom of the stud back to the sole plate. If you build your house around a gun safe, make sure you get a good reliable, serviceable gun safe because you’re not going to be able to take it out to replace it. It’s also best if you put the gun safe in at the last possible moment when the minimum of contractors will see it. If your gun safe is bolted down and burglars successfully attack it in place, they still have to carry off all your stuff. Part of the reason stealing a whole gun safe is so attractive is because even though it’s heavy, it’s a self-contained package. Imagine trying to get away with 20 guns and long guns without a case, bag, or container to hold them. If you leave gun cases, duffle bags, and luggage around it makes it that much easier to get all of your stuff out of the house. You might want to get a locker or toolbox to keep all that stuff in so you can keep it next to your gun safe. Marking your valuables will make it much easier for the police to recover them. If burglars steal tools and guns and the police find the tools, it may lead them back to your guns. Painting the handles of your tools a certain color, engraving your name or license plate number, or using a spray paint stencil of your initials on your power tools are all ways you can do this. Automotive touch-up paint pens, available at auto parts stores and your car dealer, are good for applying durable paint marks to metal surfaces. Giving the police pictures of what was stolen (previous step) and/or telling them to be on the lookout for a bunch of tools with orange-painted handles can make your stuff easier to identify. The police might even check a local flea market or pawn shop if your valuables are that easy to identify. As soon as you realize your house has been broken into, stop. Don’t touch anything. Call the police to come write a report. Once the police have checked out the scene, get your camera and take pictures of everything. Then you can look and figure out what’s missing. The best safe in the world is no help if someone breaks into your home and waits for you to come home, forcing you to open it at gunpoint. In this situation, classified as a robbery not a burglary in most states, a silent alarm could help. Some electronic keypad combination locks can be configured so that an alternate duress entry code triggers a signal that can interface to your monitored alarm system. Another option is a hidden alarm button inside your safe, but for that to work the robbers would need to let you open the safe door yourself. Since they already know there are guns inside, that’s not likely. Some gun safe owners employ a strategy to keep smash-and-grab thieves from finding their gun safe. Their strategy is based on the assumption that “once they get their arms full, they’re out’ta there.” This may be true for some percentage of burglars, but I’m not sold on it. I’m listing it here in case you have ideas along these lines. 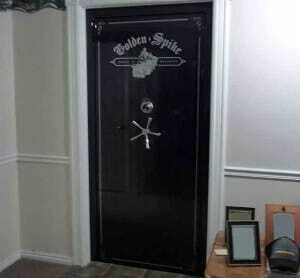 The idea is to leave some attractive but cumbersome valuables near the back door or other common burglar entry points. For example, some larger tools or electronic equipment like a CD changer and DVD player. The hope is that once the burglars have all the goodies they can carry, they’ll leave. My mom’s last burglars ran right past a laptop computer, DVD Player, and other electronics straight upstairs to her bedroom to get all of her $20 earrings, and then left. The research shows that most burglars go to the master bedroom first, so it’s doubtful that most thieves would leave without first checking it out. Most smash-and-grab burglars would rather have cash, jewelry, or something valuable and small that is easy to carry. They don’t want to be seen running through the woods with a TV set. This strategy is dubious. At best it will guarantee that something gets stolen and at worst it will help professional thieves get your stuff faster. And, once a house is burglarized, the odds become much higher that it will be hit again. Put your gun safe in a place that offers good protection if you do have a flood. 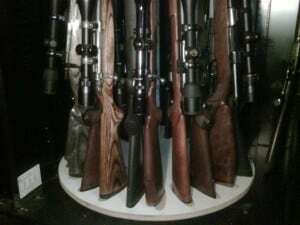 The higher your gun safe is, the better it will be protected from water damage due to flooding and firefighting water. Getting your gun safe off the floor is especially important if you decide to put your gun safe in your basement or otherwise below grade. Concrete or steel is the best material for a platform. Wood can rot, be damaged by fire and insects, hold water, and corrode the bottom of your gun safe. It’s also harder to secure to the floor and gun safe. With a little work you can build a concrete platform to put your safe on. Some rebar can be used to anchor the platform into a concrete floor. Once poured, a concrete platform is ideal for anchoring the gun safe. If you’re a welder you can devise a platform which can be anchored to the floor and securely bolted to the gun safe, with steel plate to protect the bolts. A nice feature of a steel platform is that you can probably bring it with you if you move. Many gun safes, especially cheaper ones, have minimal paint and corrosion protection on the bottom. If yours did have some, it was probably partially scraped off during installation. If you’re locating your gun safe on a surface like concrete which may hold moisture, or in a non-climate-controlled location, it’s a good idea to put a moisture barrier under your gun safe. Whatever you use needs to be strong enough to withstand the weight. A hard rubber horse stall mat is a good choice. Even a piece of vapor barrier of the type used in residential construction under vinyl siding will offer some protection against corrosion. Gun safe waterproofing is dubious, as discussed earlier. But that doesn’t mean there’s nothing you can do to keep mosisture out. If you have a tube of high temperature silicone caulk or RTV around, use it to seal all the holes in the bottom of your gun safe. Don’t forget the electrical access hole. 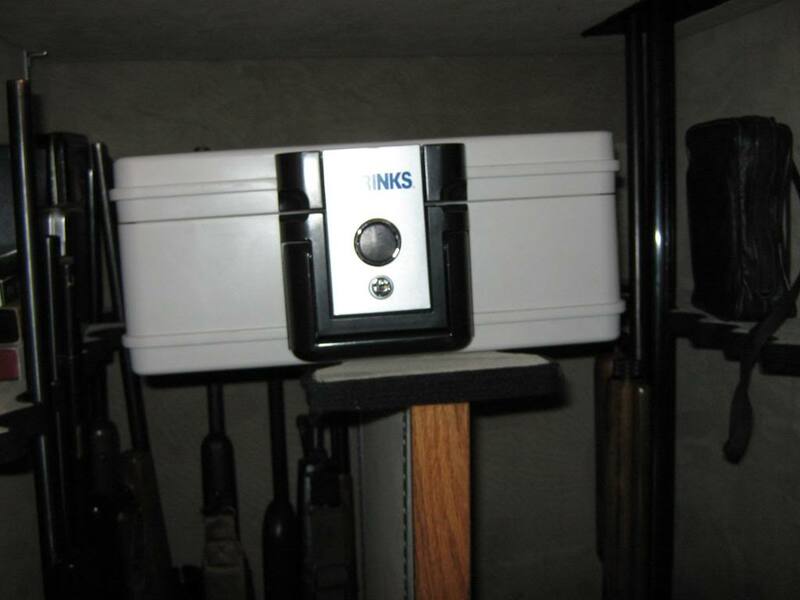 Moisture is a big problem in gun safes, especially for those installed in non-climate-controlled areas. Don’t forget that the danger isn’t just from outside the gun safe, but also from the fire lining. There are two strategies for dealing with moisture. Notice the floor mounted electric dehumidifier and fire safe inside. 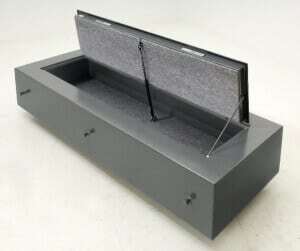 One way to reduce humidity is to slightly warm the interior of the gun safe using an electric dehumidifier. This raises the air temperature for the same dew point, reducing the relative humidity. Heater-type gun safe dehumidifiers also reduce inside temperature fluctuations during the day. Temperature changes can cause condensation if the temperature drops below the dew point. If the dehumidifier is located in the floor of the gun safe, it will also create a small, helpful convection air current inside the safe. A plug-in gun safe dehumidifier requires almost no maintenance as long as the power is on, and is the recommended approach. The other strategy is to absorb the moisture in your gun safe by using a desiccant dehumidifier. Desiccants, like the silica gel packets you find in consumer product packaging, are chemicals which absorb moisture. Periodically you’ll have to replace the desiccant, or bake it out in your oven to recharge it. The desiccant chemicals used in some dehumidifiers are corrosive. This is not good if the container breaks and the chemical comes into contact with your guns. If you do go with a desiccant style dehumidifier, check the chemical and make sure it’s not corrosive to guns. Most of us have enough things to worry about, so electric dehumidifiers are a better choice. If you have installed lighting in your gun safe which presents a very low risk of fire, you can leave the light on to protect from moisture. The lights will produce a small amount of heat like a gun safe dehumidifier, which will help keep your gun safe free of moisture. Quality name-brand Florescent or LED lights are good for this purpose. Incandescent bulbs or light ropes can get too hot. Over time, hot lights degrade their electrical insulation, increasing the risk of starting an electrical fire. Most fire lining used in true safes and gun safes contains moisture that can damage your guns. The moisture level is highest when the safe is brand new, so it’s a good idea to leave the door open as much as possible when the safe is new to dry out the fire lining a bit. 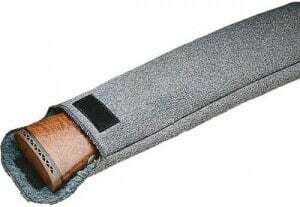 Padded gun sleeves, especially those which impregnated with silicon and rust preventatives like Bore Stores, are a great way to protect your guns from corrosion. The padding helps prevent handling damage like scratches and dings when you’re taking your guns in and out. These sleeves can also help you fit more guns in your gun safe or job box, allowing you to just stack the guns like cord wood. You can also keep your guns in the sleeves and bring them with you to the range. The more efficiently your gun safe is organized, the better protected your guns will be from nicks and scratches due to handling. If your gun safe came with an interior that isn’t optimized for the types of guns you have, take it out and modify it. The time you spend with be more than repaid in convenience and prevented damage to your gun over the years from taking them in and out. Even if you purchase a commercial safe with no interior, fabricate or buy your own shelving and racks. A number of companies offer long gun rotary racks or door racks that can make better use of the limited space in your gun safe. Many provide better protection and more convenience at a cheaper price than the factory interior. Coating your guns with a rust preventative before storing them in your gun safe will help prevent corrosion. If this is your primary method of rust prevention, keep in mind that it will also need to be applied to the inside of the bore, and surfaces you can’t see like under the stock and forend. On the recommendation of Nathan Foster, I started using marine lanolin-based grease Lanocote for longer-term protection of gun finishes. It holds up well, so now I give all of my long guns a thin coat before reassembly. Note if Lanocote is used to treat a barrel bore, it must be cleaned out before firing. 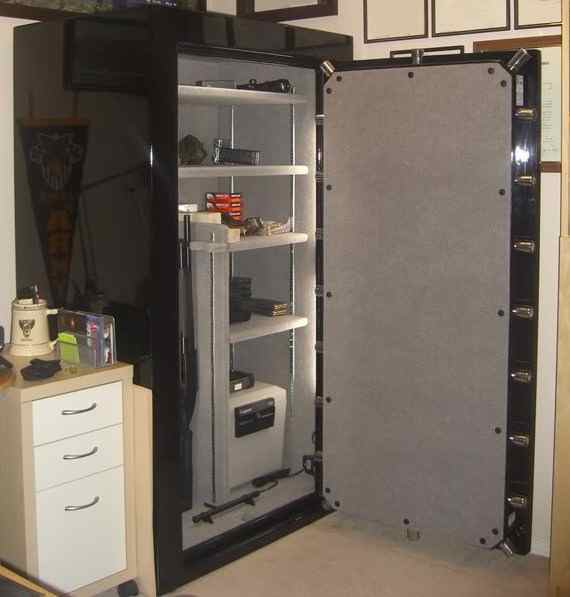 Most gun safes come with some sort of long gun rack, but only shelves for your handguns. If you don’t want to use handgun sleeves, a handgun rack can help protect your guns from handling damage. Another option for handguns is drawers. Because handguns are thin, even a shallow drawer will fit them and keep them safe. If you have some papers and manuals for your guns that you really want to store in your gun safe, put them in a waterproof container inside your safe. Ideally the container should have a melting point above 350 °F, otherwise when it melts or ignites it will do more damage than the water would have. You can improvise a door seal to help keep out moisture, especially on the lower portion of your door. It should be made of high temperature material like silicone if you want it to be any help in a fire. A word of warning on door seals: Be very careful with anything that holds pressure against the door when closed, especially on cheap gun safes. Tension on the back of the door acts against the locking bolts, requiring extra force to retract them and open the safe. This pressure can cause problems with your gun safe lock, especially electronic ones. Many gun safes use shear pins and clutches in the locking mechanism to prevent or limit extra force from being transmitted from the door handle to the locking bolts. If the shear pins or clutch fail, or prevent you from applying enough force to retract the locking bolts, you’ll need a locksmith to open your safe. Seals that work against the outer edge of the door instead of the back are less likely to cause bolt work issues. In addition to protection from theft, there are many money-saving ways to keep your guns safe from fire. The majority of home fires are put out without calling the fire department (sources for fire statistics). Spending hundreds of dollars on a fireproof gun safe is pretty foolish if you don’t have $20 fire extinguishers in both your kitchen and bedroom. These are the most common origins of fire. A fire is likely to break out in the kitchen, bedroom, living room, garage, laundry room/area, and attic. You should have an ABC fire extinguisher accessible in all of those locations. Sprinkler heads are relatively inexpensive and come in a variety of styles. You may already have a water line above your gun safe feeding a bathroom in the floor above. For those of you with well water, keep in mind that if a fire is bad enough, the electricity will get cut off and your well will stop. By that time though, the fire department will hopefully already be there fighting the fire. The majority of cheap gun safes use about $20 of gypsum drywall for fireproofing and offer minimal fire protection. These units unfortunately also have minimal burglary protection. For most people burglary risk is about 5X higher than fire. So, rather than buy a cheap RSC which has minimal protection from both burglary and fire, you might take a different approach. First, you’d buy an “Exceptional Gun Safe” or True Safe with better burglary protection but no fire lining. The savings can be significant, and this also opens your options for finding a used true safe. Then, you can buy $20 of Sheetrock and add fireproofing yourself. If you want to “splurge” find some glass fiber reinforced drywall instead. Gypsum isn’t the best fireproofing in the world, but most people’s fire risk is much lower than burglary. At least now the relative expense you’ve spent protecting from the two will match their risks better. In addition it will be easier on your wallet. Install the drywall the same way they build houses. “Hang the lid” first by measuring and cutting the top sheet. Then hold it up top and measure the sheets for the side walls so that they support the top piece. Cut and install them, followed by the back. Try to get some drywall around the door frame as well. Then do the bottom. You can do as many layers as you want in this fashion, which will stagger the joints for the best coverage. Remember the top gets the hottest, so you want the most sheets higher up. Don’t forget the door. The better you support the drywall the better the fire protection it will offer. Picture the gypsum crumbling and then think about how to hold it together. Glass fiber reinforced drywall has fiberglass built in for support. 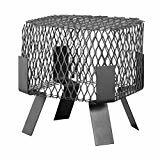 You can also line the interior with wire mesh, sheet metal, lauan plywood, or regular plywood. The better sealed the interior lining, the better. You could caulk the panels with a high temperature silicone caulk. To make it easier to see inside the gun safe, use a reflective or light color material, or paint the interior white. Homemade fireproofing complicates the interior shelving and racks but can save you even more money. Similar to new car dealer options, gun safe interior upgrades have higher markups than the gun safes themselves. If you get the safe with no interior, you have more freedom to install unconventional options like a rotary rack or rifle rod storage kit. Or you could fit more guns inside and avoid handling damage by stacking your guns in BoreStores silicon treated padded sleeve or soft cases. In most cases you’ll have to figure out the shelving yourself. A nice feature of lining the interior with metal, lauan, or plywood is that it gives you something convenient to mount the shelves to. The metal can be pop-riveted to and the wood can be screwed into. Instead of fixed shelves you can mount adjustable shelf brackets on the sides from top to bottom. Inexpensive adjustable wire shelving is another option you may already own, which will also help with air flow and moisture inside. Don’t use a gun safe to protect things it isn’t meant to protect. If you want some fire protection for important documents, photos, electronic media, jewelry, and other valuables, get a UL 72 Fire Endurance safe with an appropriate rating for the contents. This safe can usually be much smaller than a gun safe, and so will be much cheaper. It will also help you divide your valuables into different locations. If you have a really expensive handgun or other valuable and you really want it protected from fire, you can layer fire protection. Put it inside a real UL 72 rated small fire safe in the bottom of your fireproof gun safe. This will give you layered protection from fire, although make it more likely to get stolen by burglars than if it was hidden separately. As discussed in Myth: Ammo is safe inside a gun safe, don’t put your ammo in your gun safe. If you insist on putting ammunition in your gun safe, or you’re storing it in your decoy gun safe, store it at the bottom. The bottom has the lowest temperature and most protection from fire, but the highest risk of flooding and water damage. Moisture will damage ammunition over time but it is relatively waterproof for short periods. So the bottom of your gun safe is the best place for it. Gun safes located in garages are often near gasoline cans and power equipment, paint thinner, aerosol cans, lumber, and other fuels. Some gun cleaning products are flammable, and shouldn’t be stored in a gun safe. Moving these fuels far away from your guns is cheap protection against fires. If you have a wood burning stove or fireplace, coal, or oil heat, have your chimney cleaned. Confined chimney or flue fires are the third most common cause of fires. The buildup of creosote and other flammable compounds can lead to fires. Also, parts of your firebox, chimney lining, flue, or crown may need repair or repointing. Chimney cleaning is the most common time that these problems are found. If you have a wood burning stove, embers can blow up your chimney and start fires on your roof or in neighboring vegetation. Installing a chimney screen will reduce this risk. It also reduces the risk of an animal making a home in your chimney during the warm months. Is there anything I’ve missed? If you have a great idea or picture of your great idea, share it. Leave a comment or contact me and let me know. If you’ve decided you want a traditional gun safe then Where to Put a Gun Safe is the next article in this series. At this point you may have decided that you don’t want or need a conventional gun safe. If you have, I’m happy I could save you some money. You can check the Buyer’s Guide for ideas on inexpensive non-traditional gun safes like Buried, Hidden, Diversion, and even Motorcycle Gun Safes.